The Tony Awards will be presented this weekend in New York City. 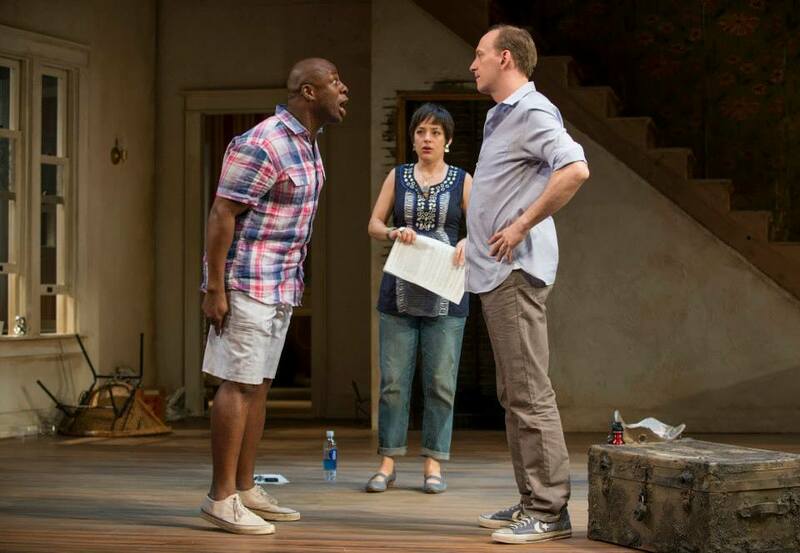 But if you want to catch last year's winner for best play, Minneapolis is the place to be. Bruce Norris wrote Clybourne Park as a follow-up to one of the most important American plays of the 20th century, Lorraine Hansberry's A Raisin in the Sun (which I saw four years ago, a co-production with Penumbra Theatre also in the Guthrie's Proscenium Theater). The 1959 play about an African American family buying a house in an all-white neighborhood deals with issues of racism and desegregation. In Norris' follow-up, we see how things have changed since then, and how they haven't. 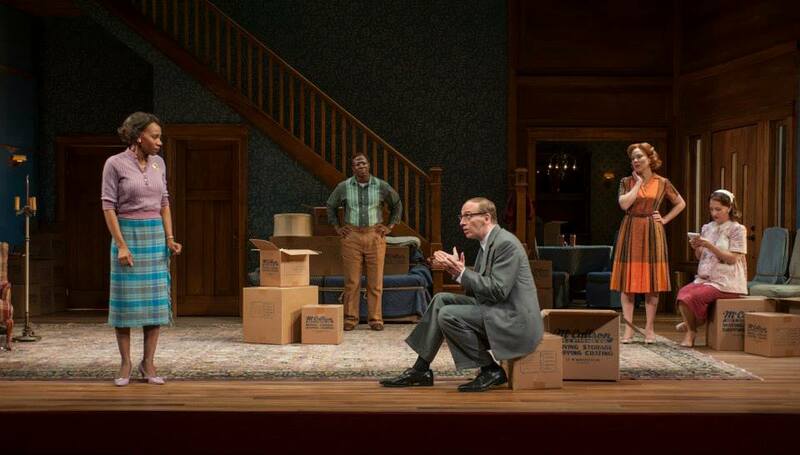 The first act of the play is set in 1959, in the very house that A Raisin in the Sun's Younger family buys, as we see the other side of the story that play told. We follow the one white character in Raisin, a neighborhood representative named Karl who tries to buy the family out, as he talks to the homeowners and tries to convince them not to sell to the Youngers. Act II jumps forward in time 50 years but the place remains the same. The house has become run-down, the neighborhood working class and mostly black. The tables are turned as a white couple meets opposition from neighborhood residents to the changes they want to make to this house in a neighborhood that is undergoing gentrification. 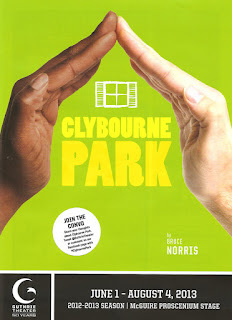 Clybourne Park is a really well-written and well-constructed play, funny and smart and sharp, and the dream cast includes some of the best actors in town. In other words - it's a definite must-see. The house in question is owned by Bev and Russ. Or rather, was, as they're selling to move to a new location and a better life. Bev is busy packing boxes with the help of her black housekeeper Francine, while Russ sits by eating ice cream and reading a magazine. They've had sorrow in this house, the specifics of which unfold throughout the first act. The couple is visited by a few friends, including Pastor Jim, and Karl and his deaf wife Betsy. Karl pleads with Bev and Russ not to sell to a "colored family," as his patient wife sits by not following much of the conversation. He pulls Francine and her husband into the discussion, who politely refuse to take part and make their exit. Things get heated as Karl won't give up and Russ won't give in. The house is sold, and 50 years later, we see the same cast inhabiting different, although sometimes slightly similar, characters. A white couple has bought the house and is planning to make significant changes. They are meeting with an African American couple who lives in the neighborhood and has brought a petition against them. Both couples have brought their lawyers and are trying to work through the petition, which never seems to happen as other discussions take place. The discussion soon devolves into a trading of racist jokes, reminding me of the satiric song from Avenue Q ("Ethnic jokes may be uncouth but you laugh because they're based on truth. Don't take them as personal attacks, everyone enjoys them, so relax"). Both acts feature awkward, uncomfortable, and down-right ugly conversations about race, and it's fascinating to observe the differences and similarities between the two time periods. The way that the sexes and the races interact with each other differs greatly between 1959 and 2009, and the language they use is different, but many of the underlying themes are the same. I just can't say enough about this cast, most of whom portray two different characters in two different time periods. Jim Lichtsheidl is the bad guy in both stories, but even when he's bad he's good! He's the same character but different manifestations of him appropriate to the time, and he manages to give each of them a specific way of moving and talking. Playing his wife in both acts is Emily Gunyou Halaas, who clearly delineates the 1950s submissive wife (who's deaf and relies on her husband to translate for her) from the modern wife who's an equal partner and not afraid of telling her husband he's an idiot. Bill McCallum has the most diverse characters - the 1950s depressed husband and father much different from the sweaty unsophisticated construction worker - and wrings the most life out of both. Kathryn Meisle is sympathetic as the concerned and nagging wife, and hilarious as a modern-day lawyer who has to make everything about her. She absolutely cracked me up with her every word, every look, every gesture. Peter Hansen, another favorite, plays a sort of peacekeeper role in both acts - Pastor Jim who tries to smooth things out between his friends, and one of the lawyers trying to facilitate the discussion. Shá Cage easily transforms from the 1959 polite but knowing housekeeper into 2009's strong woman standing up for her neighborhood. Ansa Akyea is her supportive husband in both, the same but different. All of these actors (and a late appearance by talented young actor Steven Lee Johnson) work so well together; it's just a joy to watch them dig into this meaty material. The set, designed by Rachel Hauck, is truly incredible in the way it is transformed from the beautiful home in the first act to the run-down wreck in the second. The bones are the same but the surface shows wear - peeling wallpaper, dirty and stained walls, doors and fixtures no longer where they were. I would love to watch that transformation take place behind the curtain! Clybourne Park is the kind of play that I love - smart, funny, and well-written, it made me laugh, and feel, and think, and squirm in my seat a little. It takes a big bite out of current issues without offering pat answers, but gets the audience thinking. What more can you ask of a play? I know I like pretty much everything (I'm a bit of a stamp tramp like Marshall on How I Met Your Mother), but this is the best play I've seen in months, maybe even all year. I hope this play is a smash hit this summer, it deserves to be. I hope people go see it and then have those uncomfortable conversations, it's the only way we can hope to move past them. Clybourne Park officially opens this weekend and runs through August 4 - put this play first on your list of things to do this summer.